Mike yesterday also published an excellent piece supporting an article by Rachel Heeds in the Huffington Post. Heeds had writing an article about the bullying of Corbynistas by the Blairites. She talks about how, far from seeing violent racist thugs at Momentum rallies, she has just seen normal people talking and discussing. Occasionally the discussion gets heated, but she’s never seen anyone storm the stage or hurl abuse. As for Momentum supporters, many of them are ladies of a certain age more likely to bake cakes for events in support of Corbyn than anything remotely violent or abusive. But the Blairites have resorted to abuse and bullying in order to shout down their opponents. Mike states he’s suffered from it in the last few days. I know other people, who’ve also commented on the sheer venom and scatological abuse directed at Corbyn and his supporters on social media. But Tom Watson has done nothing. Indeed, he and the other Blairites in the Parliamentary Labour Party have taken the lead in hurling this abuse, through the hysterical accusations of Trotskyite infiltration. Heeds has also talked to Corbyn supporters, who have been left seriously distressed by some of these allegations, including those in the Mirror about ‘Gulags’, and Mark Foster’s splenetic denunciation in the Mail Online last Sunday about Momentum as a gang of Nazi stormtroopers. One of those left distressed and upset by that article is Rachel Nesbitt, the other of the Facebook page, Jeremy Corbyn’s Terrible Thugs – #Thuginistas. Nesbitt is Jewish, and part of the distinguished Horvitz family, a group which played a leading role in European Judaism for centuries. Like very many British Jews, she also lost family members during the Holocaust. Now she finds herself smeared as the very people, who murdered her family, by Foster. You don’t need much imagination to sympathise with her deep outrage at this vile smear. And all this is done to shut down debate, by people who are accusing Jeremy Corbyn and his supporters of doing so. See Mike’s article http://voxpoliticalonline.com/2016/08/19/labour-party-bullies-like-tom-watson-and-michael-foster-must-not-be-allowed-to-win/ and following the links to Heed’s piece in the Huffington Post. One of the worst hypocrites in this bullying is Angela Eagle, who stood up and stated that ‘we need a kinder, gentler style of politics’ while spouting the lie about Corbyn supporters shoving a brick through her constituency office window. There’s also more than element of hypocrisy in Foster’s vile smear about Momentum supporters being Nazis. There’s the obvious fact that Momentum supporters aren’t anti-Semites, and Corbyn’s supporters include many Jews and people of Jewish heritage. Mike also covered a piece by the Skwawkbox, which did a point-for-point rebuttal of Foster’s allegations, starting with the fact that he had walked calmly through a Momentum demonstration for quite a long time before anything happened. If they Momentum really was a hard-right organisation of Jew Haters, quite simply he wouldn’t have been able to do this. The real Fascist organisations are violent thugs, many of whom have committed murder. They have absolutely no qualms about attacking and savagely beating trade unionists, Jews, Blacks, Asians and Leftists when- or wherever they find them. If Momentum were like them, Foster wouldn’t be able to walk around them for five minutes before the abuse, threats and violence started. But there’s another issue surrounding Foster’s slur. Foster has accused other Jews of being Nazis, which is exactly the same accusation that was leveled at Red Ken. Leninspart was accused a few years ago, if you remember, of anti-Semitism because he had allegedly compared a Jewish journalist to a concentration camp guard. I’ve read accounts of the incident by others outside the Right-wing media, which recited this allegation. I’ve forgotten the details, but it’s not quite like they portrayed. Livingstone isn’t an anti-Semite. I’ve made this point again and again. You only have to read his condemnation of racism, and the British state’s active recruitment of Nazis, including those actively involved in the Holocaust and pogroms, in his 1987 book, Livingstone’s Labour, to see that. And the same accusation has been made against Jews and people of Jewish heritage like Tony Greenstein, Jackie Walker and now Rachel Nesbitt, either personally or simply because of their membership of Momentum. But Foster has not been accused of anti-Semitism for his allegations like Livingstone, or the Jewish people he smeared. This shows very clearly the hypocrisy and double standards of the Blairites and right-wing media. It’s disgusting, and shows once again why these papers and broadcasters can’t be trusted. This is hilarious. Mike over at Vox Political has a piece about a report from the Huffington Post on how Nikki Morgan and her plans to privatise the British educational system went down with Teacherdom Assembled, as Stan Lee would see if he wrote for a teaching magazine, rather than being a comics mogul. The short answer: very badly. First of all, she was heckled when she tried defending her policy to the NASUWT. This in itself is actually very serious, as Morgan is doing what the Tories have been doing for nearly three decades – destroying British education for the profit of private education firms, and trying to make electoral capital by blaming teachers for the defects of their innovations. What’s funny is that a group of teachers have noted the vacant expression in Thicky Nikki’s eyes – the expression that says ‘the lights are on, but Mrs Brain went walkabout a long, loooong time ago’, and adapted a punk classic to describe it. Remember The Adverts’ ‘Looking Through Gary Gilmour’s Eyes’, about the serial killer, who donated his eyes to science? A group of teachers, Gary Kaye and the Enemies of Promise, have a version of it, ‘Looking Through Nikki Morgan’s Eyes’, which ends by stating that ‘she don’t need her eyes to see’, because Nikki has departed reality.’ It also helps that the band itself is really good, so the satire isn’t forced or hollow. The articles at: http://voxpoliticalonline.com/2016/03/26/nicky-morgan-mocked-in-song-as-shes-laughed-at-by-teachers-at-nasuwt-conference/. Go there and have a good satirical laugh. Cameron has been loudly proclaiming that he’s a ‘One Nation’ Tory. This was the group formed in the Conservatives in the 1950s to support the welfare state created by the Labour party following the Beveridge Report. 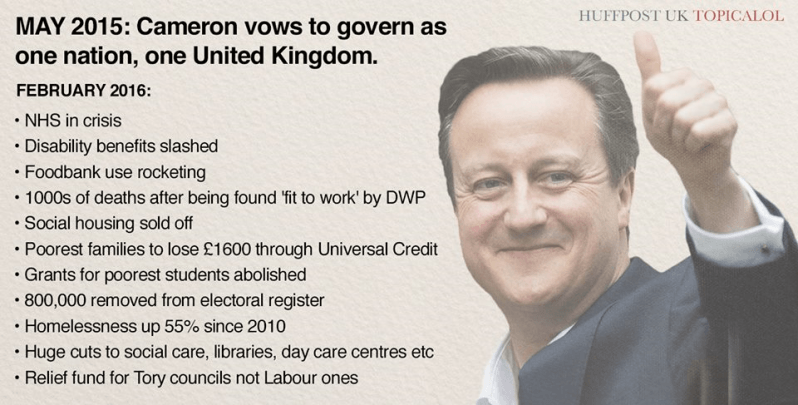 Mike over at Vox Political reblogged this little meme from the Huffington Post, showing just how much Cameron has supported the welfare state in fact. From this long catalogue of cuts and privatisation, it’s clear that the last thing Cameron is, is a true ‘One Nation’ Tory. If even that rare beast exists any longer. David Willetts wrote a defence of the welfare state in his book, but you can be forgiven for wondering how far he believed in it, considering he was a member of Maggie’s cabinet. Cameron’s actions belie his rhetoric. Don’t be taken in by his lies.